As I have been climbing and watching other climbers with an attention to detail for over 20 years, I have come to a few conclusions about leading traditional, sport or highball boulder problems. 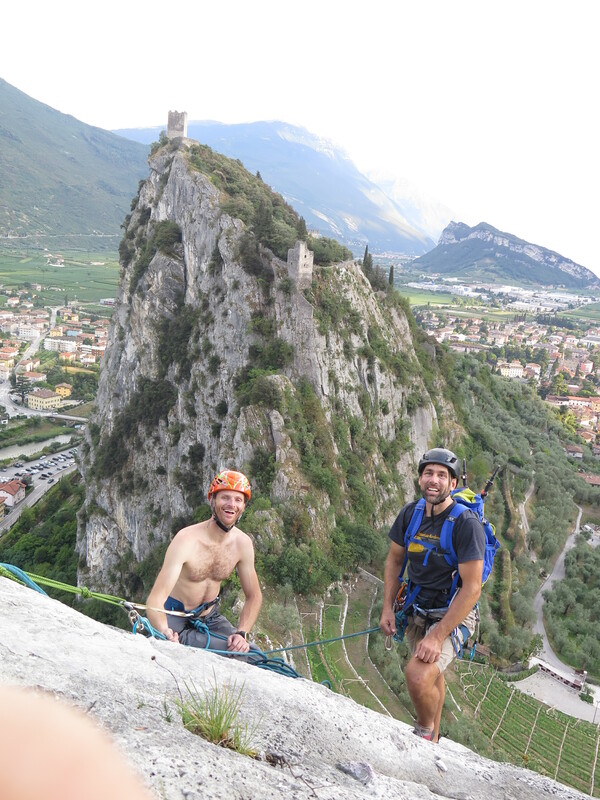 Erik Weihenmayer and I before his ascent of the Marmaloda via Don Quixote 5.10+. Leading routes can be a treat or the bane of your climbing day. Often times we get distracted by the spacing between bolts or gear. Sometimes we loose focus due to the difficulty of the moves and other times due to the conditions (exposure/wind/temperature…). Part of leading successfully comes from practicing. That could be done on easier routes or boulders indoors, but that rehearsal sometimes doesn’t transfer over to the outdoors. Part of leading successfully comes from having the proper mindset. That can come from how you take on challenges, your persona and your successes in overcoming challenges be it physical or mental. When on a route that has been climbed before and I am onsighting, I constantly tell myself that if it was dangerous that no one would be climbing it. I remember that normally the most run out portions of climbs are the easiest sections and that I am a competent climber on all types of terrain and that this is no different. I look back to my rehearsal (if I am projecting the climb) and just focus on the successful attempts and execute each movement perfectly at the perfect time. I commit to going for it because I know that there is normally a good hold or stance to clip or place from. I remind myself that growth comes from discomfort and trying new things and that coming out of my comfort zone will only promote my mental and physical growth. I tell myself that this is why I came climbing today. I hope that some of these ways to cope will assist you with your climbing progression. Sound advice. Focusing too much on the next piece of protection rather than just enjoying the climbing is something I do too much. It takes practice to get your focus right in this respect and I guess I need to keep practicing.